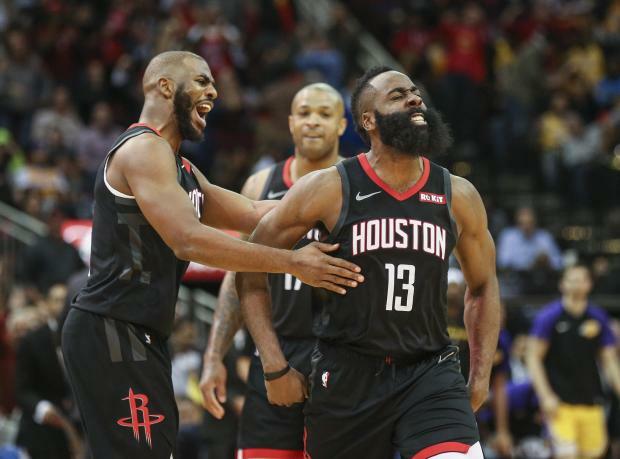 James Harden recorded a 50-point triple-double and came through during a decisive stretch in the fourth quarter to lift the host Houston Rockets to a 126-111 victory over the Los Angeles Lakers on Thursday. Harden posted 50 points, 10 rebounds and 11 assists to thwart the Lakers, who were 6-1 in their previous games. With Houston clinging to a 109-106 lead following an explosive dunk by the Lakers' Kyle Kuzma with 4:16 to go, Harden sank three free throws before drilling consecutive 3-pointers. The last one rolled in after a tantalizing dance on the rim, extending the advantage to 12 points. Harden accomplished the scoring flurry in just 54 seconds. Kuzma scored 24 points and handed out five assists to complement another strong performance from LeBron James, who tallied 29 points on 12-of-18 shooting. The Rockets got a double-double from Clint Capela (16 points, 14 rebounds) while Danuel House Jr. delivered 15 points in 29 minutes off the bench. Chris Paul added 14 points, nine assists and three steals. T.J. Warren scored a game-high 30 points, and Phoenix snapped a 10-game losing skid with a victory over visiting Dallas. Phoenix picked up just its fifth win of the season and first since knocking off the Milwaukee Bucks on Nov. 23. Dallas, which continued its up-and-down, home-road act, saw its three-game win streak end one night after extending its home win streak to 11 games. The Mavs have dropped their past three road games. Dallas star Dirk Nowitzki made his season debut after missing the first 26 games following offseason ankle surgery. He was limited to six minutes off the bench, and he scored two points. Harrison Barnes led the Mavericks with 15 points. LaMarcus Aldridge poured in 27 points on 12-of-14 shooting in just three quarters of play as San Antonio romped past visiting Los Angeles for its fourth consecutive win. Rudy Gay added 21 points for the Spurs on 8-of-10 shooting. DeMar DeRozan and Marco Belinelli added 14 each. Tobias Harris led the Clippers with 17 points, 15 of which came in the first half. Danilo Gallinari and Avery Bradley scored 15 points each for Los Angeles, which has lost two straight games and four of its past five. Nikola Vucevic hit a tiebreaking jumper with 28.8 seconds left, and Orlando emerged with a win over Chicago in Mexico City. Vucevic led all scorers with 26 points to go along with 10 rebounds. D.J. Augustin added 15 points and seven rebounds, and the Magic, who were designated as the home team, snapped a three-game losing streak. Zach LaVine had 23 points and Justin Holiday added 18 for Chicago, which has lost 14 of its past 16 games.